Sauté garlic, serrano, habanero, cumin, and pumpkin seeds in the oil in a large skillet set over medium-high heat, stirring frequently until seeds start to pop, about 5 minutes. Transfer 1/3 cup of the pumpkin seeds to a small bowl and set aside. Cool the remaining seeds and oil and combine with the cilantro, water, salt to taste in a blender. Blend until smooth and set aside. 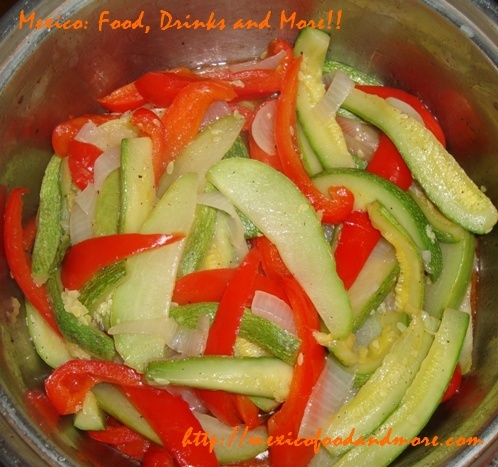 Combine serrano, tomatoes, onion, garlic, lime juice, and salt and pepper to taste. Set aside. If grilling the chayote, bell pepper, onion and zucchini, cut them into large wedges. If sautéing the vegetables, cut them into large strips. In either case, cook them until tender with a bit of oil and season them with salt, pepper, and cayenne to taste. Cut the grilled vegetables into strips once tender. Spread 1 tablespoon of pumpkin seed salsa on each warm tortilla. Add some of the vegetables, and roll it up. Heat about 1/2 cup oil in a large skillet set over medium-high heat until hot. Fry flautas seam side down, turning once, and cook until golden and heated through. 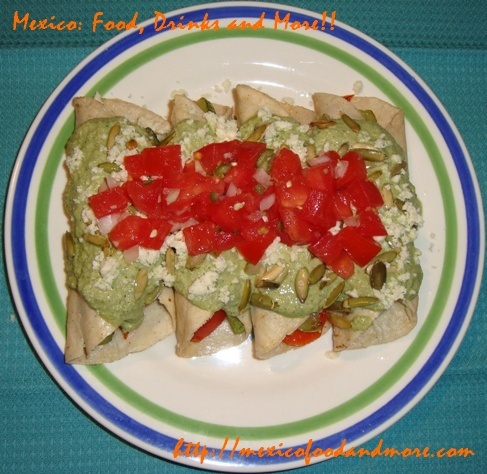 Transfer flautas to plates, topping them with pumpkin-seed salsa and a sprinkling of reserved seeds and cheese. Garnish with the tomato salsa. This entry is filed under Dinner, Salsas, Vegetables. You can follow any responses to this entry through the RSS 2.0 feed. You can leave a response, or trackback from your own site.